With Father’s Day coming up next weekend, we’re going to be featuring some cool products for dads, and we’ll be putting a bunch of them together in a full guide that will be published later this week. We’re kicking things off with this cool trunk organizer from Samsonite. 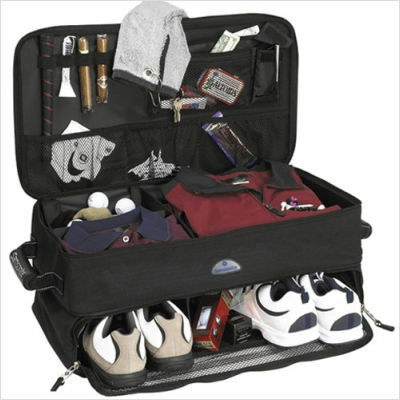 It’s a great gift for any guy who loves to golf, and it will help him organize that messy trunk. The organizer is the ideal size for any trunk or back seat. With two levels, it fits nicely in the trunk but it doesn’t take too much space. The bottom level has room for three shoes, so you can fit more than golf shoes. The ventilated mesh front door makes it easy to see what’s in there and it makes it possible to air out the shoes while storing them. The top level has a bunch of compartments to store all sorts of stuff, from phones, to sunglasses and cigars, along with golf gear like gloves and tees. It also has movable dividers so the user can customize it in the way that fits his needs. There’s plenty of room for stuff like shirts, shorts, jackets and more. It’s a great gift, and you may want to pick one up for yourself as well.